The greatest festival of the Indian subcontinent is back and with it have arrived (according to me at least) clay lamps and paper kandils (lanterns). Nothing gives me greater pleasure than the consumption of organic and eco friendly products and I'm more than happy to loosen my purse strings for the greater good of our planet. Lesser use and sounds of crackers bursting lighting up polluting down the night sky, lesser use of hazardous string lights and greater use and encouragement of clay lamps and their hardworking makers makes the festival of lights worth its name. Each night as we pour oil into our lamps, lets remember how we have unknowingly lit up the lives of our underprivileged brothers and their families as well. I personally stopped bursting crackers when I was fourteen but over the years have tried to inculcate the true spirit of Diwali in other areas of life as well. This means more distribution of sweets among those who help me all year round and less consumption of them myself. This means purchasing new clothes and gifting them but not to my friends but to those who's children perhaps would have spent one more year, one more Diwali without a set of new clothes. Because the presence of a five storey Retail Chain in the plushest localities of Mumbai city is proof enough that my friends do not need my gifts. So as I clear greed from my mind and my soul, I also clear it from my plate, which means I avoid the use of criminal amounts of oil to deep fry my Diwali snacks and bake them instead and while I'm at it let me also avoid the use of refined four that gives zero nourishment to my body and instead return to my roots and use a good mix of millet flours and seeds rich in good fats and fatty acids. Keeping a cleaner plate, a cleaner mind and a cleaner life in focus I've created a Diwali staple snack, made in almost all households each year - Mathri's , but I've replaced refined flour with whole wheat, sorghum and pearl millet flours and added in a good dose to sesame and chia seeds, who's nutrients are so vital to the body. 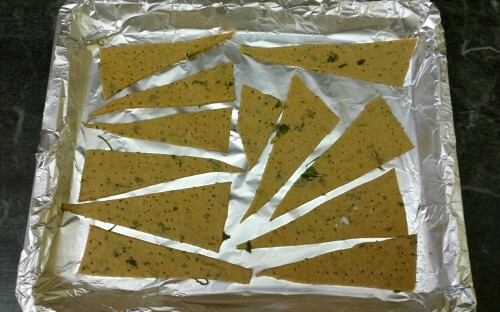 You can find the recipe for Baked Multigrain Mathris - a healthy snack with Chia seeds below. To begin making the Baked Mathri recipe, combine the flours, chia seeds, salt, black pepper seeds, coriander leaves and sesame seeds. Work the oil into the flours with your fingers until the mixture resembles coarse breadcrumbs. Sprinkle ice water onto the crumbly dough and with your hands push the dough from the sides to the middle of the bowl to form a ball that holds together and becomes a firm, yet pliable dough. Cover the mathri dough with a damp cloth and set aside for 15 minutes. Roll the dough into a large circle, and use a pizza cutter or sharp knife to cut into triangles or a cookie cutter to cut them into circles. 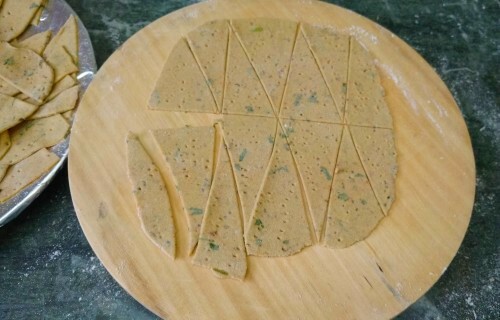 You can also divide the mathri dough into small balls and roll out all the balls into small circles of 2 inch diameter and about 1/2 inch thickness. Arrange the mathri dough pieces on a greased baking sheet and prick them evenly with a fork to prevent them from puffing while in the oven. 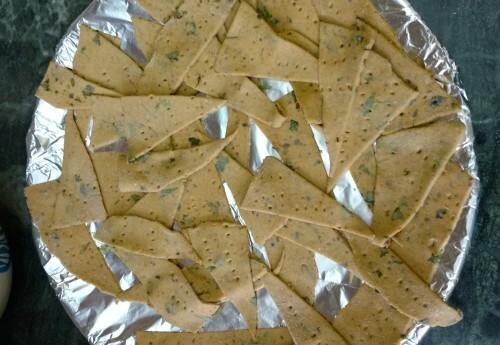 Bake the mathri's for about 20 minutes or until golden brown and crisp. Remove the mathri's out of the oven and allow them to cool completely before serving. Once cooled completely, store the baked mathri's in an airtight container. Savor these delicious Baked Multigrain Mathri’s with a spicy mango pickle as a tea time snack. This recipe was created for the Belly Nirvana Campaign is association with Plattershare and Place of Origin. Wishing you all a bright and prosperous Diwali!